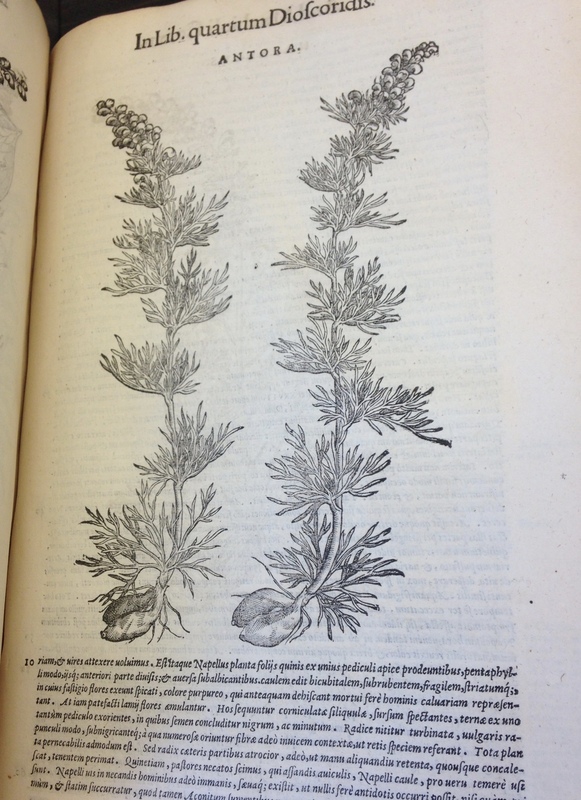 This account appears in Italian physician Pietro Andrea Mattioli’s famous herbal I discorsi (1544), which became one of the most popular medical books of the sixteenth century. Mattioli claimed to have witnessed the trial himself, as a student of Caravita’s. He used this test to highlight the toxicity of napellus, confirming Avicenna’s opinion on the herb. His description helped spread the trial of Caravita’s oil to an international audience, especially after the Discorsi was translated into Latin and several vernaculars. Yet Mattioli’s anecdote was not the only printed account of the trial of Caravita’s oil. Pope Clement himself found the results significant enough that he allowed them to be published in a short pamphlet, titled Testimonium de verissima ac admirabili virtute olei composite contra pestem & Omnia uenena (Testimony of the Most True and Admirable Virtues of the Compound Oil against Plague and All Poison). 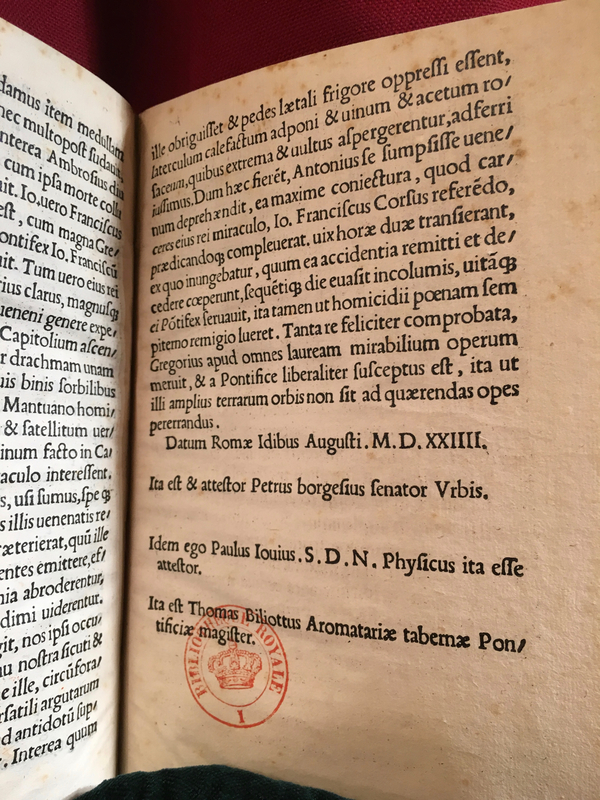 The pamphlet, dated August 13, 1524, was signed by Clement’s personal physician Paolo Giovio, the apothecary Tomasso Biliotti, and the Roman Senator Pietro Borghese. Significantly, it was addressed “to all good mortals” (omnibus bonis mortalibus). 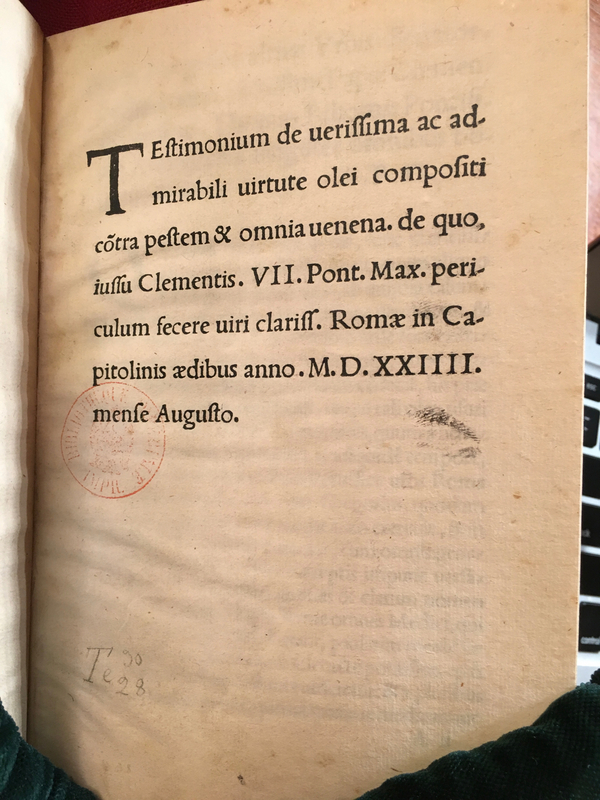 From the very beginning, the Testimonuim purported to serve a public good by alerting Romans to the marvelous effects of Caravita’s oil. The authors noted that Caravita had used the oil to great effect on plague patients in the hospital of San Giovanni Laterano during the terrible plague that had struck Rome the previous year, “in the time of Pope Adrian VI.” After the city had begun to recover, “many people” began to ask Caravita whether his oil was good for more than just plague, to which he replied that the marvelous oil could “combat all poison wonderfully.” Anyone who suffered from a toxic substance could be cured simply by applying the oil (an external remedy). These promises were impressive enough that they were brought to Pope Clement, who proclaimed that a test should be conducted on “condemned bodies” for the benefit of the general public. The trial took place in the Capitoline prison on two “murderous and crass” Corsican prisoners, Gianfrancesco and Ambrogio, who had been condemned to die by beheading. The medical practitioners had made a special poisonous cake out of marzipan mixed with a half-ounce of napellus from the Apennine mountains. Before they were given the poison, the prisoners were attended by “godly men,” who said numerous prayers on their behalf and urged them to ask for forgiveness of their sins. (These attendants were almost certainly members of the Confraternity of San Giovanni Decollato, which took charge of guiding condemned prisoners in Rome to a good, pious death.) The executioner was then sent away – to the joy of the condemned prisoners – and the poison trial commenced. The prisoners were given the poisonous marzipan along with wine. Ambrigio, a “savage spirit” who, although the younger of the two prisoners, had committed the more heinous crimes, ate his marzipan cake haltingly and frequently demanded more wine. Gianfrancesco, who had a guilty conscience and the “fullest Christian faith” (fides Christianae plenissimus) devoured not only all of his marzipan cake but also half of the one that Ambrogio had left behind. He appealed to Ambrogio with “many holy words” to trust in God, who could forgive his sins, but Ambrogio remained unmoved. The authors thus drew a deliberate contrast between the pious criminal Gianfrancesco and his nefarious counterpart Ambrogio. Ambrogio’s reluctance to take the poison did not save him. Caravita noticed that he had eaten only a partial portion of his marzipan, and in order to subject both criminals to the “same experiment,” gave him an egg mixed with a half drachma of napellus powder, combined with sugar. The testers then liberated both men from their handcuffs, but left Ambrogio lying in chains in the large prison cell. Gianfrancesco was carried to the next room and set upon an old mattress. The testers – Giovio, Borghese, and Biliotti – told Caravita to try to save the life of Gianfrancesco with the oil, but they instructed him to leave Ambrogio to the effects of the poison. After two hours, Gianfrancesco began to complain of pains of the heart, and he suffered from pallor, nausea, and vomiting – an indication that the poison had taken effect. Caravita gently anointed the prisoner’s temples, the pulses in his arms and legs, and the area around the heart. Gianfrancesco quickly revived and gradually improved with frequent reapplication. He eventually returned to his full health, and Pope Clement allowed him to live (though relegated him to the galleys). Ambrogio, meanwhile, suffered the terrible effects of the poison and died after four hours. After this success, Giovio, Borghese, and Biliotti conducted a second test using arsenic on a Mantuan murderer named Antonio. This time, they took steps to make sure that Caravita was not trying to pull a fast one on them: “we observed him most closely and gave the poison and the oil with our own hands and attended to him, lest (Caravita), after the customs of itinerant surgeons, trick us through some slight of hand.” The testing procedure passed muster, as did the antidote. Antonio recovered and received a pardon from Pope Clement, although like Gianfrancesco, he was sent to the galleys as a punishment for murder. The pontiff awarded Caravita a hefty sum of money for his marvelous cure. There are many fascinating aspects to the pamphlet by Borghese, Giovio, and Biliotti, but perhaps the most significant is the merging of concerns about the trial’s validity with attention to morality and the public good. In the test conducted on Gianfrancesco and Ambrogio, Caravita made sure that both men had eaten the same amount of poison. In the trial on Antonio, the pamphlet’s authors closely watched Caravita to make sure he was not deceiving them. At the same time, the tests were presented as in accordance with local customs and Christian morality. All three men were attended by the confraternity that would help guide them to a pious death. In the first test, only the repentant criminal, Gianfrancesco, received the antidote. The tests were conducted not for personal gain (although Caravita made off very well), but for the “public good.” In a time of recurring plague epidemics and rampant fears of poison, any word of a successful remedy would be welcome. By inserting both medical and moral reassurances, Giovio, Borghese, and Biliotti testified to the readers (underscored by their final signatures) that this remedy could be trusted. Andrea Carlino, Books of the body: anatomical ritual and renaissance learning (Chicago: University of Chicago Press, 1999), 103.